Below is a list of the tiaras worn by the women of the former Greek royal family. Click on the title of the tiara to be taken to pages with fuller histories, images, and much more information. Enjoy! The Antique Corsage Tiara: A floral tiara set with diamonds and pearls, accompanied by coordinating brooches. Commissioned in the early 1960s by Queen Ingrid of Denmark and given as an eighteenth-birthday present to her youngest daughter, Queen Anne-Marie. Made by converting a corsage ornament from the collection of Queen Victoria of Sweden. Worn by Queen Victoria of Sweden (as a corsage ornament), Queen Ingrid of Denmark (as a necklace/brooch), Queen Anne-Marie, Princess Alexia, Princess Theodora, Princess Marie-Chantal, and Princess Tatiana. Worn as a wedding tiara by Princess Marie-Chantal (1995) and Princess Tatiana (2010). 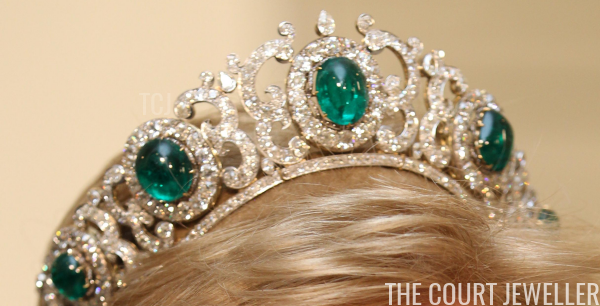 The Greek Emerald Parure Tiara: A kokoshnik-style diamond tiara, featuring the letter "E" prominently in its design, set with large diamond and emerald cabochon clusters. Convertible for wear as a necklace and accompanied by additional coordinating jewels to form a parure. Commissioned in the first half of the twentieth century by Queen Elisabeth, and made using jewels from Queen Olga's collection. Worn by Queen Elisabeth, Queen Friederike, and Queen Anne-Marie. The Khedive of Egypt Tiara: A classic tiara of diamond scrolls, some with laurel-leaf designs, convertible for wear as a corsage ornament. Made ca. 1905 by Cartier. Presented to Crown Princess Margareta of Sweden as a wedding gift from the Khedive of Egypt. Inherited by Queen Ingrid of Denmark in 1920, and subsequently bequeathed to Queen Anne-Marie in 2000. Worn by Crown Princess Margareta of Sweden, Queen Ingrid of Denmark, Princess Margaretha of Denmark, Princess Margaretha of Sweden, Queen Margrethe II of Denmark, Princess Benedikte of Sayn-Wittgenstein-Berleburg, Princess Alexandra of Sayn-Wittgenstein-Berleburg, Princess Nathalie of Sayn-Wittgenstein-Berleburg, Queen Anne-Marie, and Princess Alexia. Worn as a wedding tiara by Queen Anne-Marie (1964), Queen Margrethe II of Denmark (1967), Princess Benedikte of Sayn-Wittgenstein-Berleburg (1968), Princess Alexandra of Sayn-Wittgenstein-Berleburg (1998), Princess Alexia (1999), and Princess Nathalie of Sayn-Wittgenstein-Berleburg (2010). 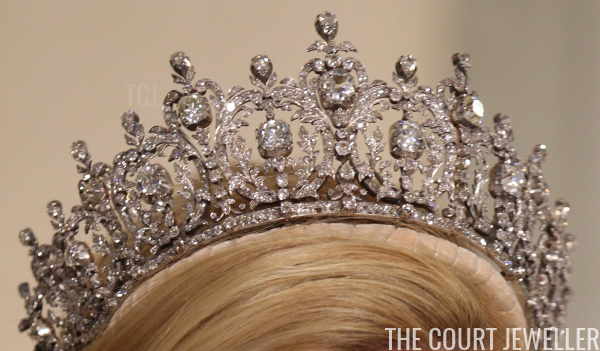 The Miller Fringe Tiara: A classic example of the diamond fringe tiara, likely dating to the second half of the nineteenth century or the first half of the twentieth century. Given to Princess Maria Olympia as a christening present by her grandmother, Chantal Miller. Worn by Princess Marie-Chantal and Princess Maria Olympia. Princess Alexia's Diamond Tiara: A densely-packed diamond tiara, featuring a lacy design of elipses and navettes punctuated by round stones. Possibly an eighteenth-birthday gift given to Princess Alexia. Worn by Princess Alexia and Princess Theodora. 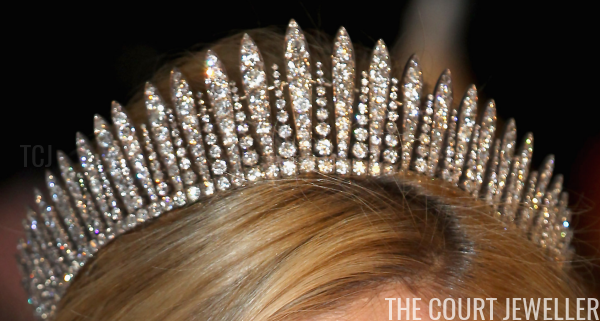 Princess Marie-Chantal's Diamond Floral Tiara: A tiara featuring geometric floral designs rendered in diamonds. Likely loaned to Princess Marie-Chantal. Worn by Princess Marie-Chantal. 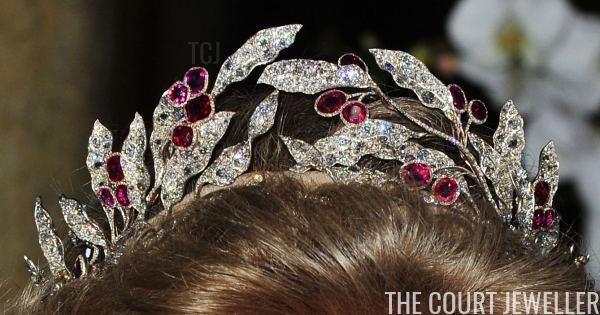 Princess Tatiana's Bulgari Tiara: A small diamond tiara with a low-profile fringe-style design. Made by Bulgari and possibly loaned by the firm to Princess Tatiana. Worn by Princess Tatiana. Queen Friederike's Pearl and Diamond Necklace Tiara: A diamond and pearl necklace, able to be placed on a frame and worn as a tiara. Worn by Queen Friederike (as a necklace) and Princess Irene. Queen Sophie's Diamond Tiara: An imposing, complex diamond tiara that includes plaque-like wreath designs. Possibly given to Queen Sophie as a wedding present (perhaps by her brother, Kaiser Wilhelm II of Germany) in 1889. Worn by Queen Sophie, Queen Helen of Romania, Queen Friederike, Queen Ingrid of Denmark, and Princess Marie-Chantal. Queen Sophie's Diamond Circle Tiara: A delicate diamond tiara of interlocking circles, sometimes worn with a drop suspended from the center circle. Originally belonged to Queen Sophie. Worn by Queen Sophie, Queen Friederike, Princess Irene, and Infanta Elena of Spain. The Ruby Olive Wreath Tiara: A stylized tiara of diamond olive branches and ruby olives, accompanied by coordinating pieces to form a parure. Originally from the collection of Queen Olga, and then passed to Princess Nicholas and Princess Olga of Yugoslavia. Purchased by King Paul for Queen Friederike, and subsequently given to Queen Anne-Marie. Worn by Queen Olga, Princess Nicholas, Princess Olga of Yugoslavia, Princess Marina, Duchess of Kent, Queen Friedrike, and Queen Anne-Marie.